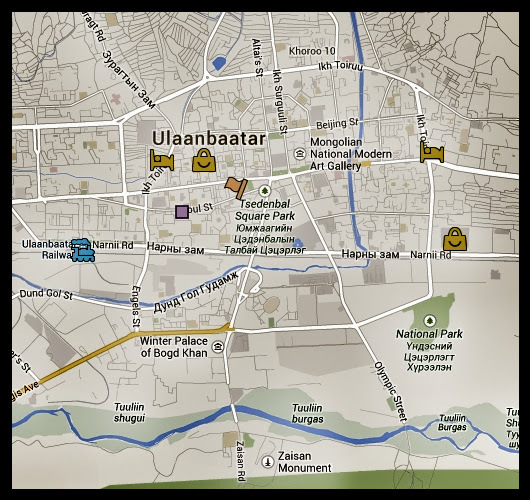 The first thing I noticed about Ulaanbaatar is that its name is never spelled the same way twice. The second thing that I notice about Ulan Bator is that it is 85% sand and dust, and 75% of that sand and dust got into my eyes. I couldn’t really see much while I was there. I did see many sidewalk sweepers in town. How do they know when their job is done? The sidewalks are just… well… dirt… and so are the roads. My brother said that maybe they are actually sweeping the dirt from off the street back onto the sidewalk. I think they could probably not show up to work for a couple of weeks or months and no one would even know that they were slacking off. As we were going out to the country side for a little trip, the car we were in had some trouble. So our guide and driver had to get another car for us. Luckily, we broke down near “the black market.” We decided to go shopping. They call it “the black market” but I don’t think that it is, because there was nothing secretive about it. It seemed like a regular flea market to me. I think that something just got lost in the translation. In the 45 minutes we were at the “black market,” we experienced two quick sandstorms. This is where half of the Gobi got into my eyes. Sunglasses are of no use here. The next time I go to Mongolia, I will bring goggles. I will look silly, but at least I will be able to see! We took an over night trip to Terelj National Park. We were able to book it through Gana’s Guest House, where we were staying. It took us about 2 hours to drive out to it. We stayed in a ger in the middle of nowhere. There were only a few farming families that lived nearby where we spent the night. We walked around the country side and there was no one around except for one or two goat herders. There were some wild horses running free and a bison or two. The bison seemed to be very tame. They would walk around eating grass and every once in a while a 13-year-old farm girl would come by to chase them away. 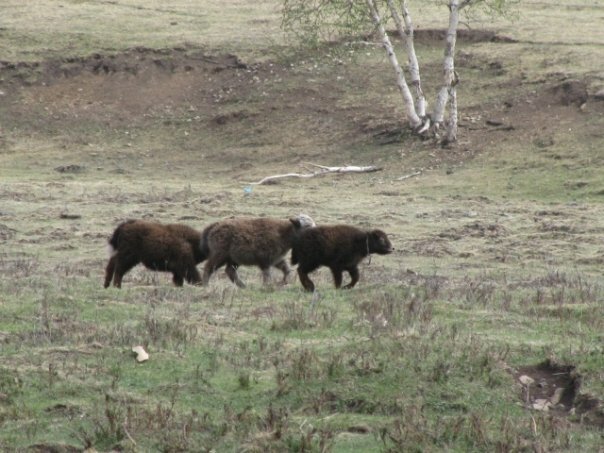 The huge bison would run in fear of the tiny Mongolian girl. 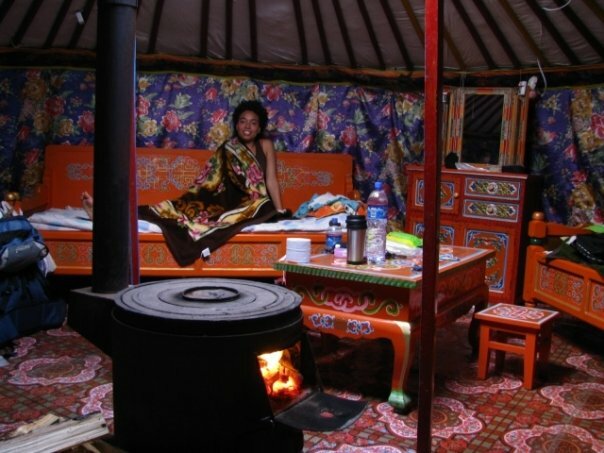 In the evening, after dinner with the Mongolian family, we went back to our ger. It got very cold really quickly, so we had to light a fire in the stove in the middle of the ger. Our guide showed us how. Once the fire was lit, my brother read horrifying fairy tales to us from a book he had on his PDA. 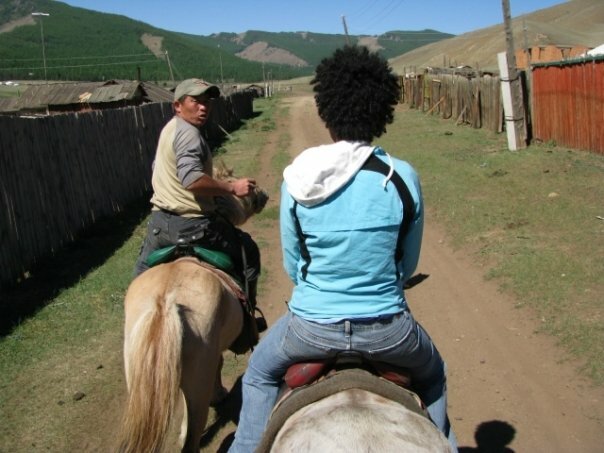 One thing I wanted to do when I got to Mongolia was to ride a tiny Mongolian horse. I know you are looking at the picture of me on the horse and you are thinking, “Man that girl is HUGE!” But it is not me that is big; it’s the horse that is small! Though, I am quite tall with freakishly long arms. This was only my second time riding a horse. The first time, I had some trouble getting on the horse even though I was using a stepladder. This time, I just climbed up onto the horse without much help. I loved riding that small horse! My family and I seemed to have gotten horses that matched our personal habits very well. My brother’s horse kept farting and my horse kept stopping to eat. I’m sure my mom’s horse was cold the whole time. 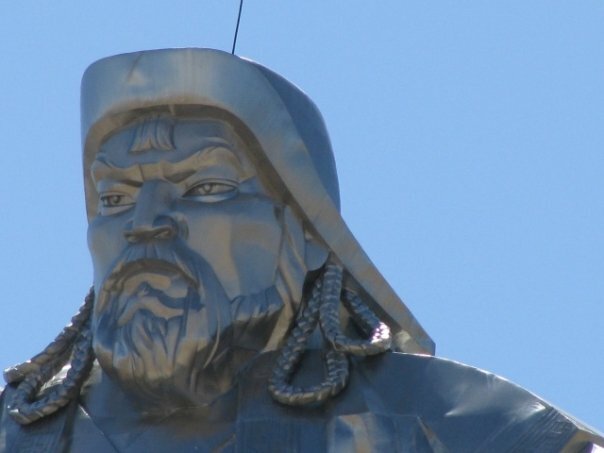 Who’s bigger than Ghaggis Khan? Later we visited a temple with a rope bridge. 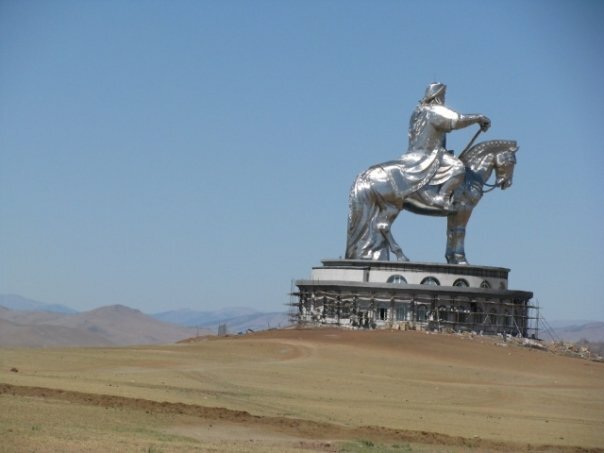 Then we saw a ridiculously huge metal Ghanggis Khan. They were repairing their metal monstrosity when we went there, so we were not able to go inside. I have no idea how the spell that guy’s name. Every time I see it, it’s spelled differently. I’ll give you Vietnam and China for Russia. Once back to the very dusty Ulaanbaatar, I needed to get a Russian Lonely Planet book. The lightest and cheapest thing to do was to find some book store or hostel to trade books. 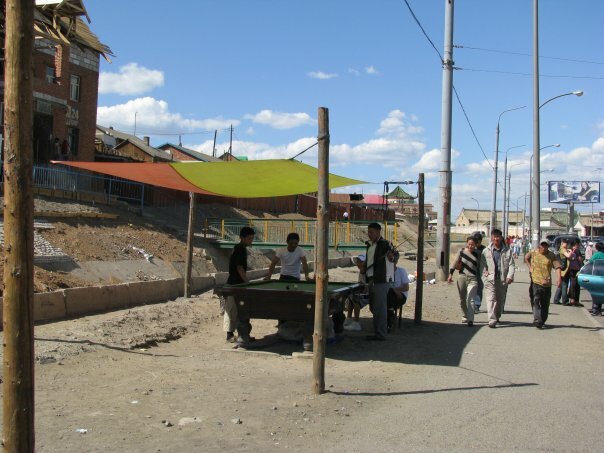 In the Lonely Planet: Mongolia they mention a book store that had a book exchange, but when we went there it was closed. However, in our hunt for this book store, we found the equivalent to “Main Street” in UB. Finding this street on our 1st day would have been helpful, since we spent a few hours looking for a bank to exchange money. We stopped several people and asked them where the nearest bank was, but no one understood us. 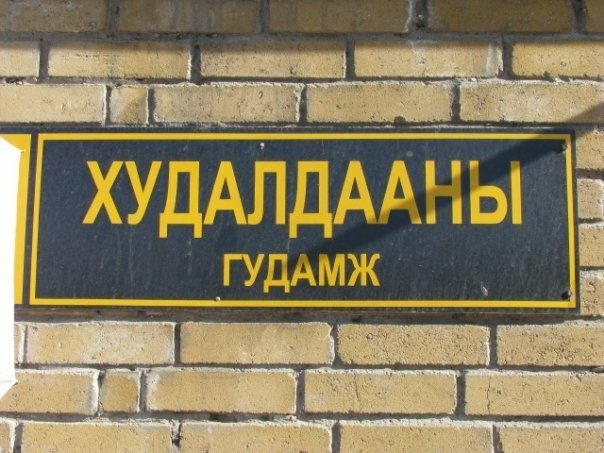 Then, I found the word bank, written in Cyrillic, in my Lonely Planet: Mongolia and pointed to it. This made people even more confused. They pointed us in one direction or another, but there was no bank to be found. I was beginning to think that there were no banks in our part of town. This main street was quite close to where we were staying and there were a thousand and one banks there, along with restaurants with picture menus, drug stores with drug labels written in English, and book stores with books in just about every language; Korean being the most popular, even more popular than Russian or Mongolian. There was one book store that looked kind of fly-by-night-ish. It was actually a very small store with a tent in front to make it bigger. This was where I traded in all the books I was finished reading and 2000 Tögrög* for one Russian & Belarus LP book. My backpack felt happier! * Unfortunately The Tögrög is not popular enough to have a currency converter on google.com. We got up early one day and walked down to the AirMarket travel agency to buy tickets on Mongolian Airlines to fly to Moscow. At the time, we thought that this was the quickest way to get to Moscow. Later, we would realize how wrong this assumption was. Afterwards we spent the afternoon looking for a park that didn’t exist. Well, it used to exist and it will again someday, but right now, and for the foreseeable future, it does not exist. It would have been nice if the city’s cartographer would take the park off the map for its non-existing period. During our search, we met a man…. 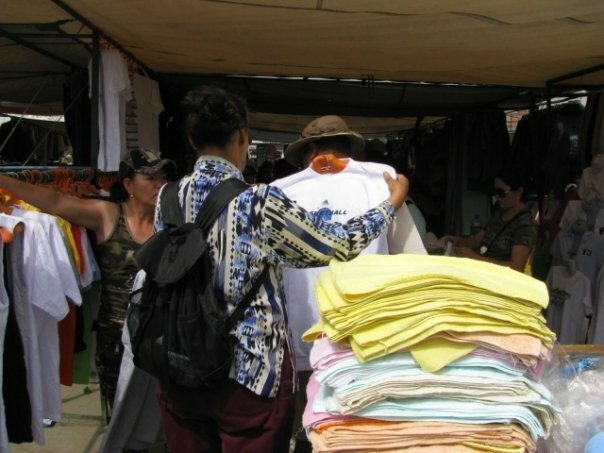 In Mongolia the vendors are very non-aggressive. This gives you a false sense of security. When pushy vendors approach you, your first instinct is the hold your purse or wallet as close to you as possible. 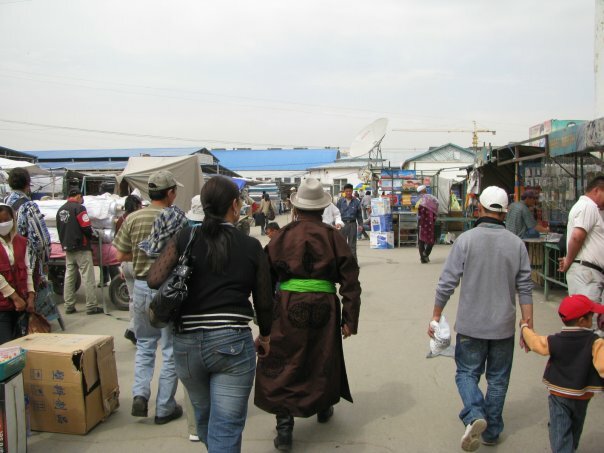 But in Ulaanbaatar people will ask you once if you want to buy something. If you say no, they go away. So, we met a man who spoke very little English. He gave us a piece of paper that said he was selling postcards and that his house burnt down some time ago, killing his wife and kids. Something about this man didn’t seem too right and we didn’t want to buy any post cards. We politely said, “No, thank you” and expected him to leave like every other vendor in town. But instead, he followed us. I am quite tall. My mother is taller than me. And my brother, so he claims, is even taller than my mom. 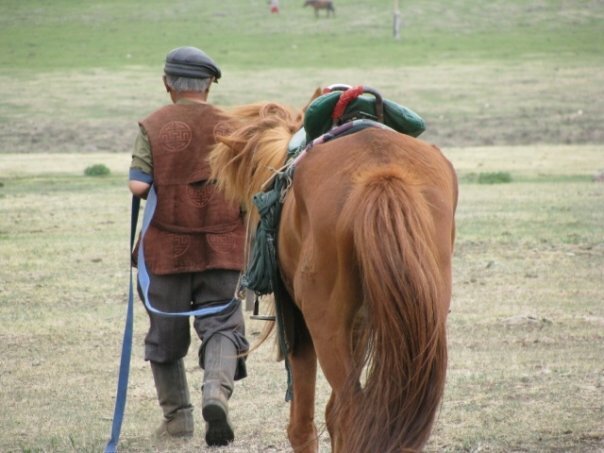 This man was short, even for a Mongolian. So the fact that he had followed us for about a block didn’t worry us, but it was annoying and as I said before, something seemed odd about him. 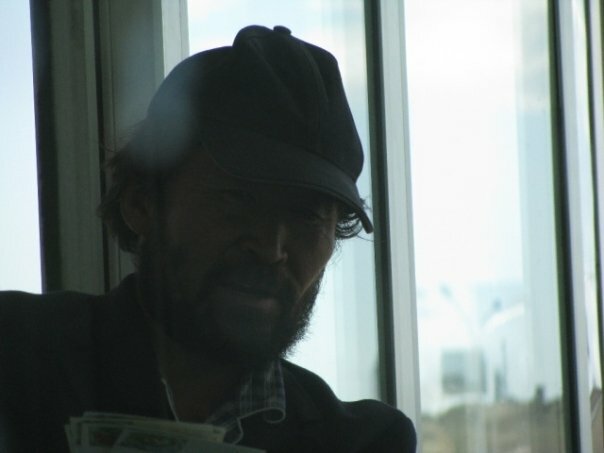 Just before he left us, he went up to my mom and told her in broken English that Ulaanbaatar is a bad city and there are too many pickpockets. What is that phone plugged into? What is it plugged into? Another thing that I noticed about the street vendors is that they all have phones. Not cell phones, but the kind with cords that plug into walls. 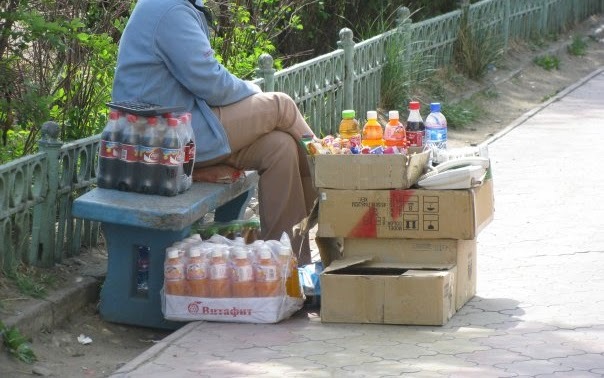 They sit on the side of the street with their goods to sell and their phone on boxes. I’m not sure what it’s for. Please let us into the terminal. 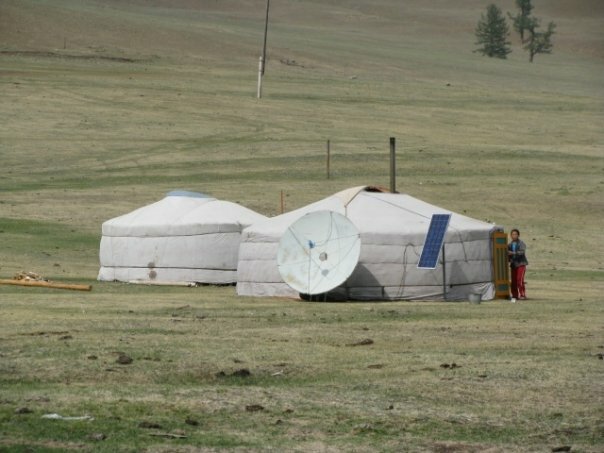 We just want to leave Mongolia. We were tired of UB and ready to see Russia. We got up earlier than we had to because we wanted to be first in line. The seats are assigned when you check in and we wanted to make sure that the three of us were sitting together with lots of leg room. 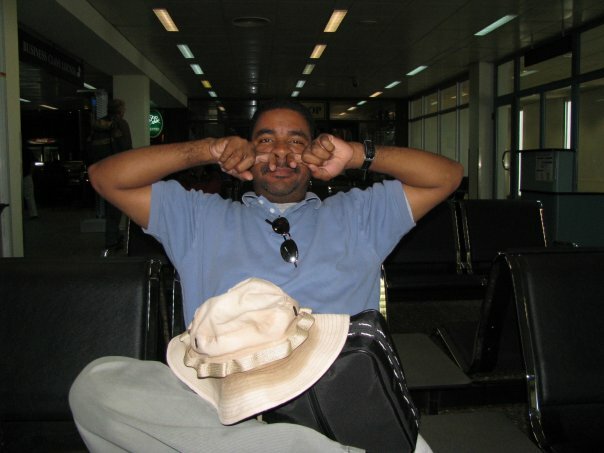 When we got to the Ghanggis Khan International Airport, the international terminal was still closed. So we stood in line at the door. Our flight was schedule for 8:20 am and we figured that check-in would start by at least 6:30 am. The guards are just watching cartoons. But the joke was on us, as 7:00 am came and went, and the doors were still locked. The security staff was inside. Some were watching TV. Others were sleeping on the bench. At around 7:30 am when the mob got too big, one of the security officers came to the door to tell us that the plane was delayed and would leave at 10:00 am. Then he went back to his cartoons. I think it was Tom & Jerry. Around 8:00 am, which would have been the start of check-in for a 10:00 am flight, we were told that there was another delay and to come back in an hour. One hour later, we were told the same thing again, but in a more annoyed way. I guess the guy was upset that he had to leave his TV to tell the passengers what was going on. Though, he didn’t really give much additional information. At 10:00 am, they told us to come back at 8:00 pm. No one told us why the plane was delayed. They all seemed to get very angry when anyone asked them anything. This is why we were waiting; a sandstorm is coming. It was sometime in the afternoon when an official of the airline told us that the reason for the delays were due to a sand storm. But by then, it was obvious, since we could see things flying around the parking lot that should not be flying around. One billboard was ripped to shreds. 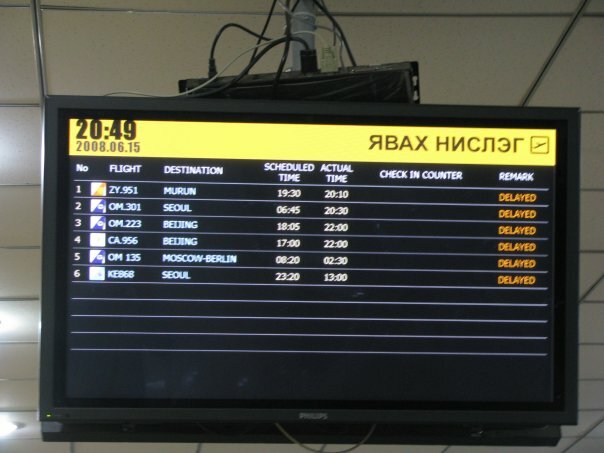 Some time that night, I took a picture of the screen with the departure schedule. When I looked at the picture to see how it came out, I noticed that our flight time had changed from 1:00 am to 2:30 am. At 12:30 am, they made an announcement that the flight was canceled. “ha ha”. 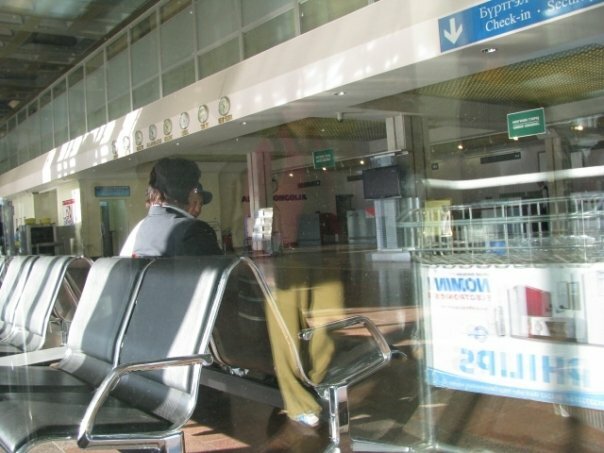 We found out from other passengers that the canceled flight was rescheduled for the 17th of June at 8:20 am. 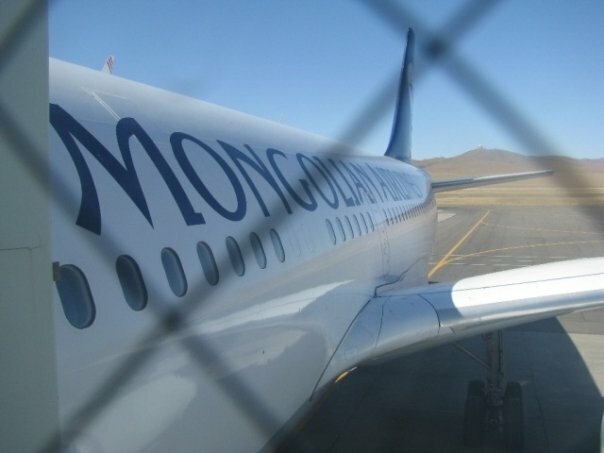 They never made an announcement about the rescheduling of the flight, so anyone who heard the announcement of the cancellation and didn’t talk to any of the Mongolian speaking passengers would have been out of luck. So we had to go back to town somehow. 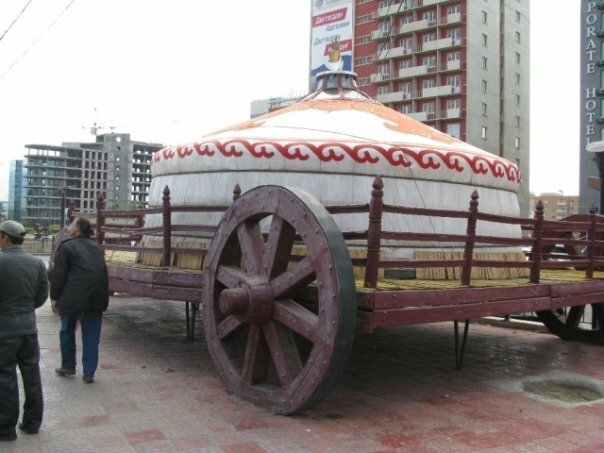 We had already spent all our tögrög since it is useless outside Mongolia. As we were negotiating with a taxi driver about the fare and if he would take euros, a lady with a Mongolian Air uniform passed by and overheard our conversation. She stopped and told us that there is a bus to town. We got on the bus, and apparently not many people knew about it. Only those who asked about it were told. 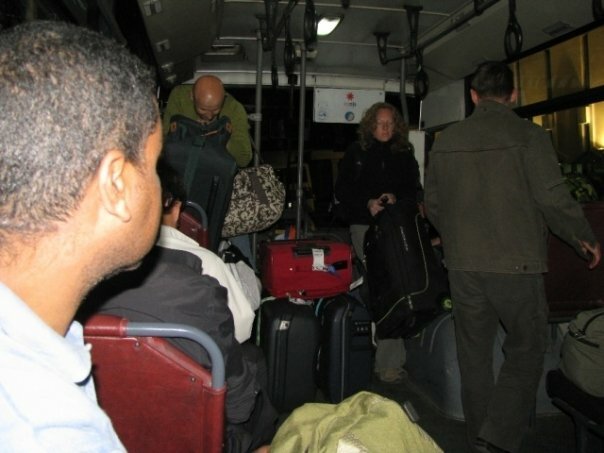 Most passengers who didn’t live in Ulaanbaatar just went home on their own dime. We got on the bus without a clue as to where the bus would take us, but we were too tired to care. We figured we could find some hotel that would take euros; our old guest house did. We drove around and passed by some really fancy hotels. Some people got off and then there were fewer and fewer people on the bus. 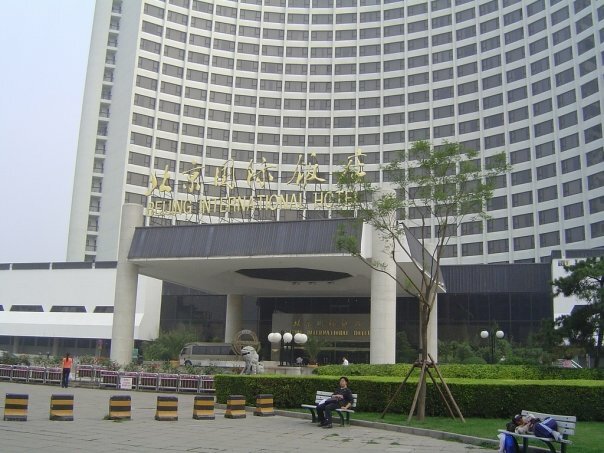 Finally, we stopped at the last hotel and everyone was told to get off. No one knew what was going on. We all stood in the lobby of a really nice hotel and we were told to pair up. We three-ed up. 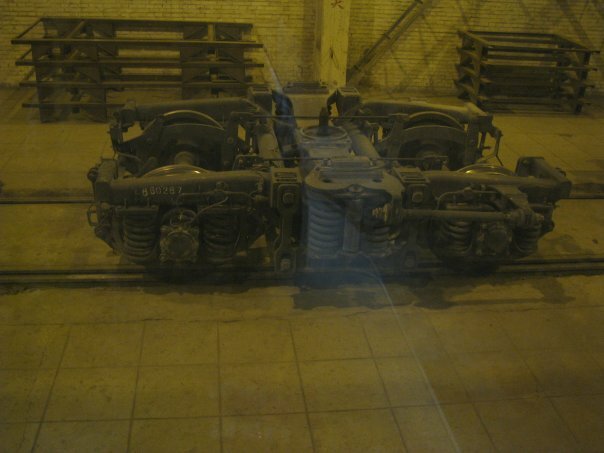 Then they gave us keys and left without any type of explanation. That guy will make any type of omelette you want, just ask him. The hotel came with free breakfast and, man… what a breakfast! My mom said that the hotel was more of the style of accommodation she was used to, but for this backpacker, I was… speechless. I thought that it was funny that no one from Mongolian Air ever told us anything. We found out about the cause of delay from looking outside. 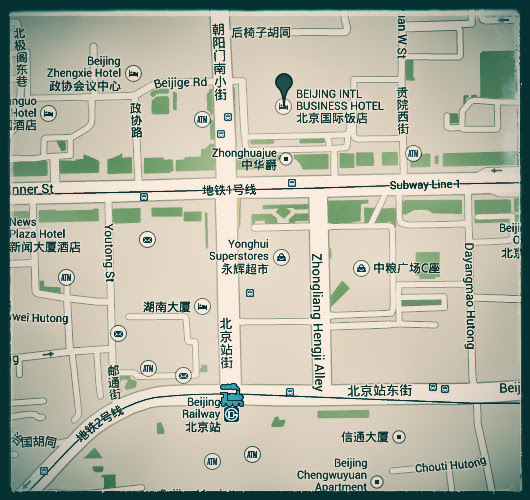 We accidentally found out about the bus and hence got the free hotel, for 2 nights. And we found out from other passengers that the flight was rescheduled and not just flat-out cancelled. It turns out that sandstorms happen a lot in Ulaanbaatar and flights are always being delayed or cancelled. So next time, I’ll take the train. It’s quicker. When are we ever going to get to Russia? The next morning started out great! I woke up really early because I was hungry, like every day… Traveling makes me hungry. I went downstairs to ask about near by grocery stores and was told that breakfast came with our accommodations. I danced down the hall to the breakfast buffet. The flight being rescheduled was a huge problem for me because of my Russian visa. It expired on the 19th. So I had to be out of Russia by midnight on the 19th. 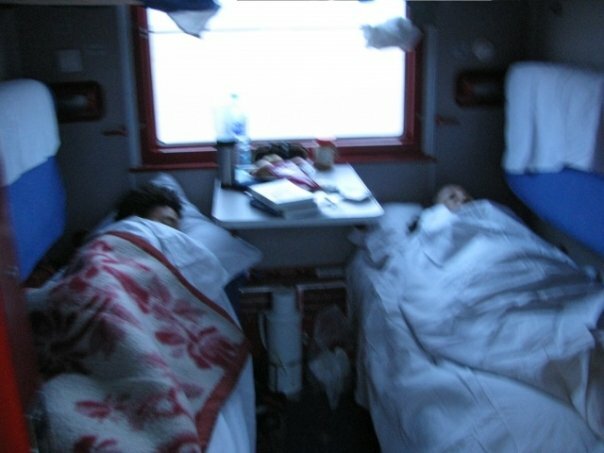 Not on a train leaving Russia, I had to be OUT of Russia or I would be thrown in jail. I’ve never been to jail, and I didn’t want my first time to be in Russia. We went to the Russian embassy in Ulaanbaatar to see if there was anyway to extend my visa. That was useless. It was like a combination of embassy helpfulness mixed with Russian-official kindness. Our plan B was for my brother to get on the internet to find a way to extend my visa and my mom and I to find a way for us to stay on our flight and go to Berlin instead of getting off at Moscow. After dealing with 2 Russian embassies, one in Korea and one in Ulaanbaatar, going to Berlin seemed a hell of a lot better. I was sick of Russia already, and I hadn’t even set foot on Russian soil yet. But nothing came of it. There was no way to extend my visa, nor for us to go to Berlin. We came up with a plan C. Run through Moscow and St. Petersburg. It turned out that 2 days of Russia was all we could handle anyway. Maybe the countryside would have been nicer… somewhere less crowded, less foggy, less… Russian. What is my brother doing? 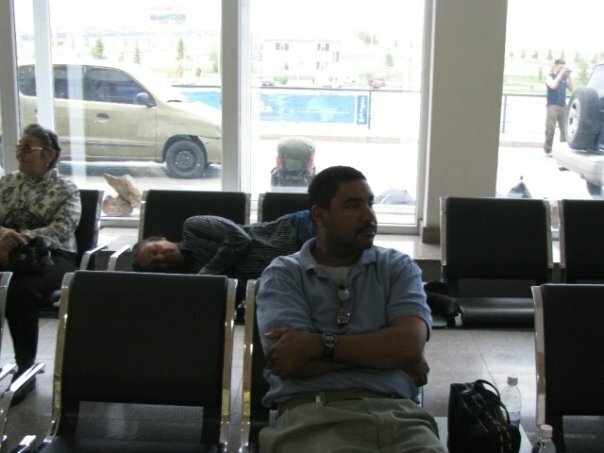 This time, we did not go to the airport early because Mongolia Air provided a free ride to the airport and it was late. It didn’t matter anyway because the flight was delayed. 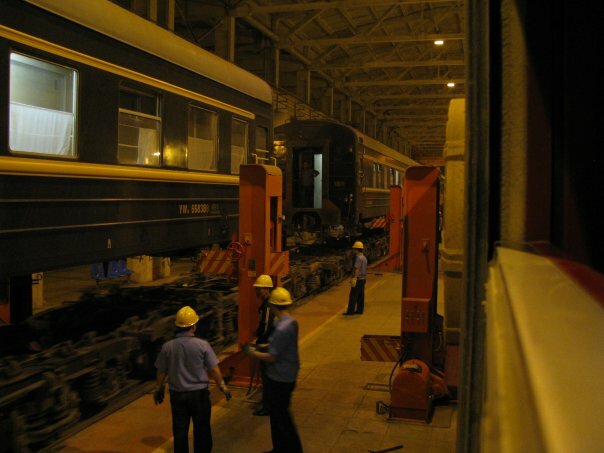 It would actually leave Ulaanbaatar at 10:30 am instead of 8:20 am. We got on the plane and took off at 11: something that morning. I almost cried like an athlete who had to overcome so much and had to fail so many times before she could see her dreams come true. 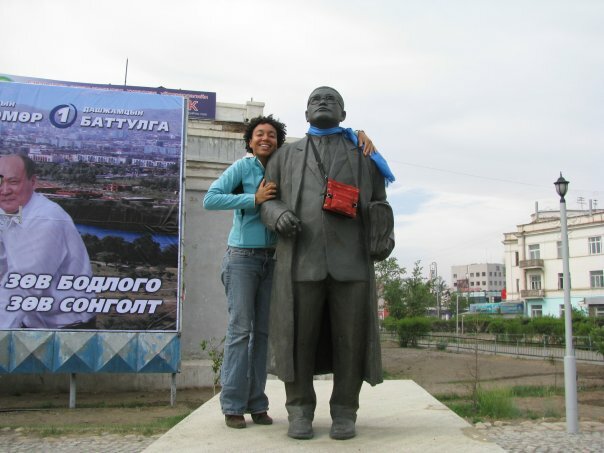 I had a dream… a dream of leaving Ulaanbaatar… and it finally came true! The only way you cannot enter this country is by boat. 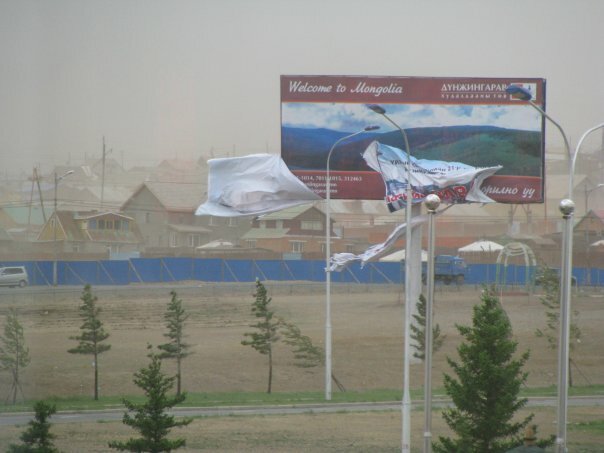 I recommend not flying into Mongolia mainly because of the constant sand storms. 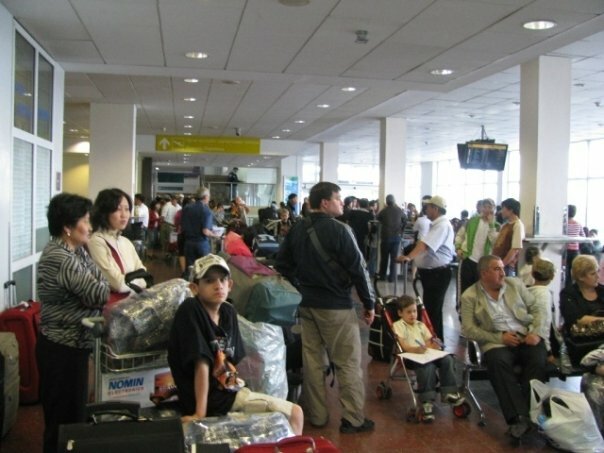 Many flights are delayed or cancelled. I recommend taking the train. 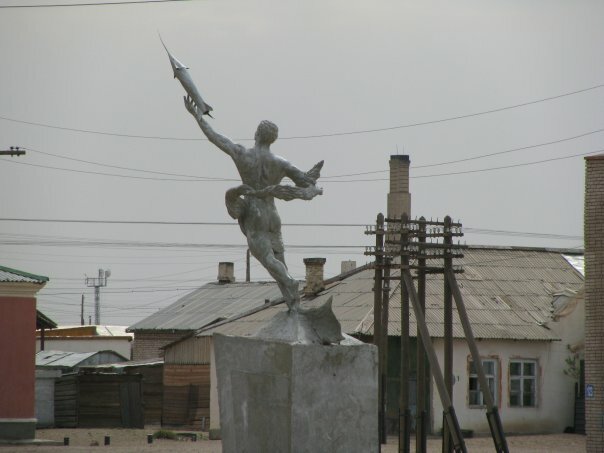 It’s a long trip since there is only one real city in Mongolia and a whole lot of nothing around it. 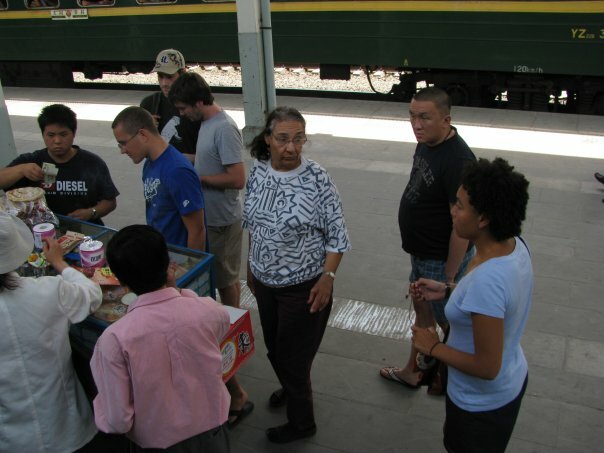 But, it is still an amazing train ride through the Gobi. 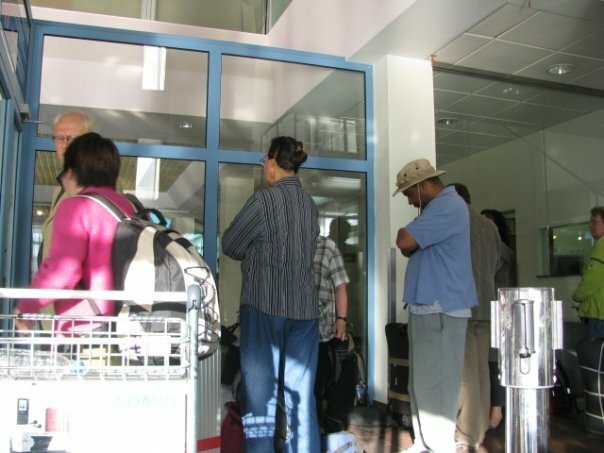 Visa Information (Very few people, if any, need a visa to enter Mongolia for a short (less than 30 day) stay. Most can get their visa when they enter the country. 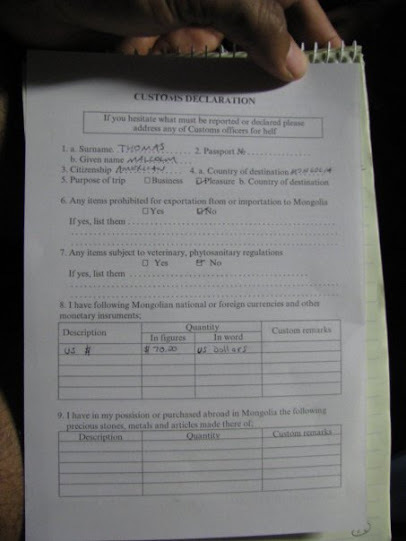 If you are a North Korean refugee and you are caught in Mongolia, you will be sent to Seoul, South Korea. 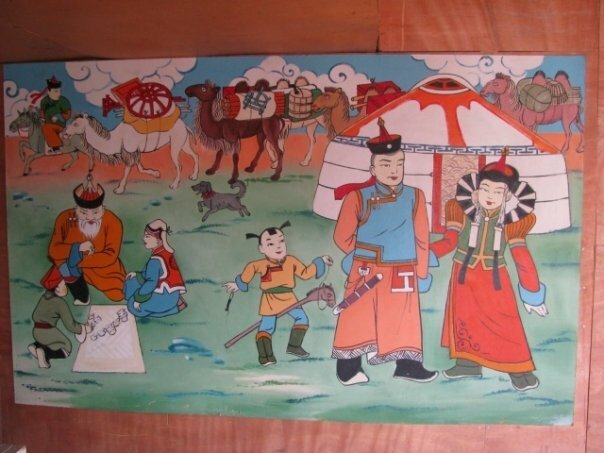 Mongolia does not recognize the DPRK as the true Korea. So, many North Koreans will risk death by crossing the Gobi on foot for a chance to get deported to South Korea. China, on the other hand, will just send the refugees to Pyongyang. 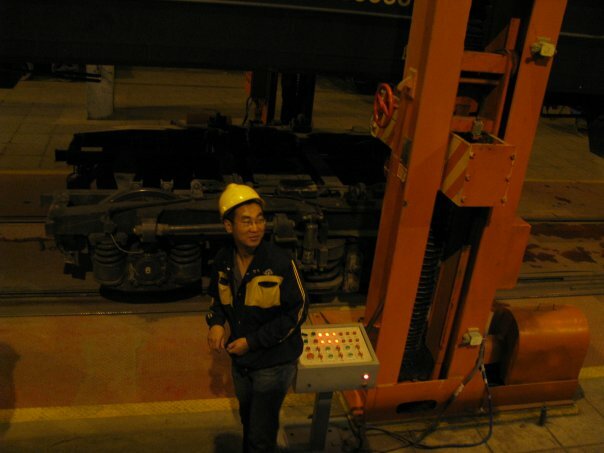 There is very little other than sand between the Mongolian border with China and Ulaanbaatar. 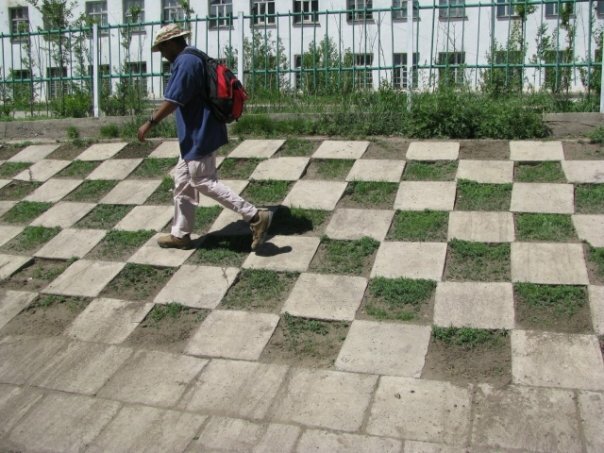 So, unless you are a North Korean refugee, do not attempt to cross the Gobi on foot. I really don’t know how to get there by public transportation. You can take a taxi there, I’m sure. then haggle your heart out once inside. This place is also known as “The Black Market” but it’s really more like a flea market. 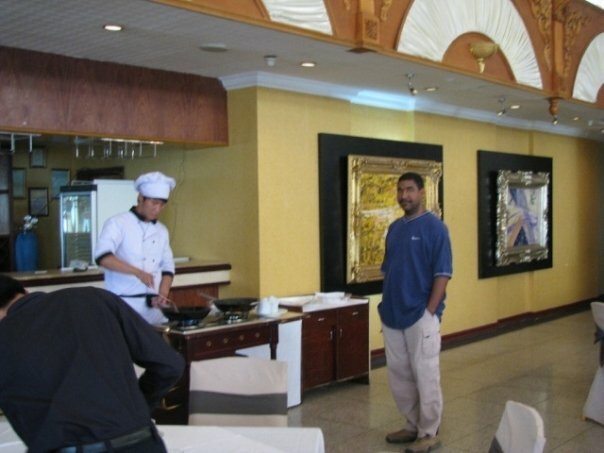 This is an okay place to try different types of Mongolian foods. 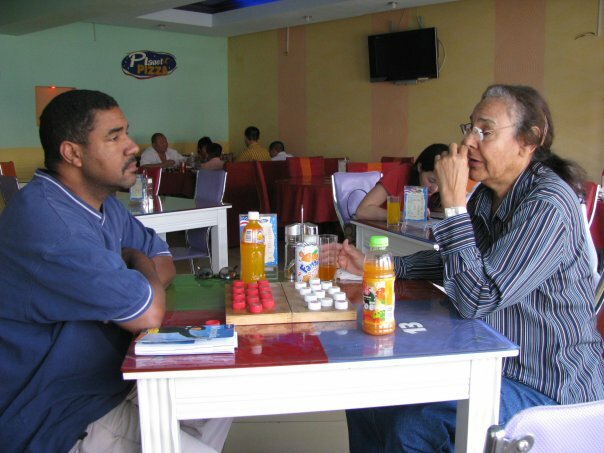 You can find many hostels and guest houses that offer trips to the park. I’m not sure if you have to go with a tour, or if you can just rent a car and go on your own. It gets very cold at night, even in the summer when it’s hot during the day. It’s not too far from Ulaanbaatar. This is a great place to do a home stay. You can sleep in a ger near a family and eat with them in their house or ger. 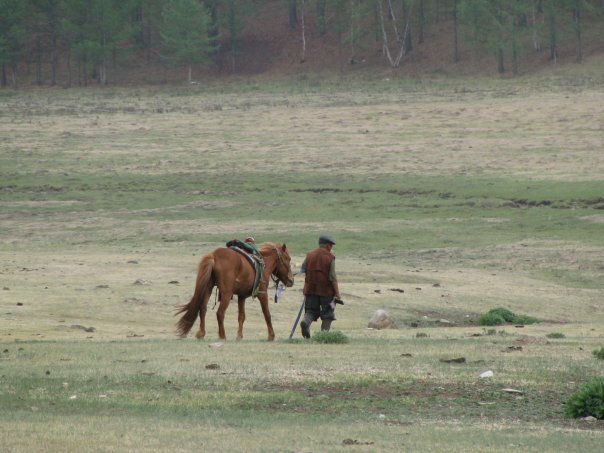 This is also a great place to ride a tiny Mongolian horse. The horses are not really tiny, just a lot smaller than other horses. 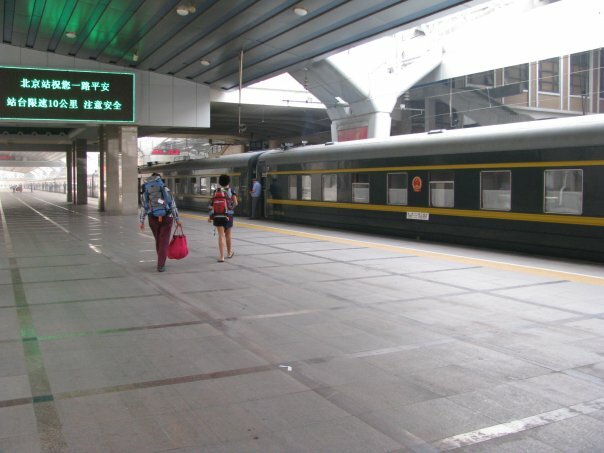 If you have reservations at the guest house they will pick you up for free from the train station. Otherwise just tell your taxi driver to take you to Gana’s Guest House near the Gandan and Betuv monasteries. You can either go by taxi or join a tour group. It’s somewhere called Tsonjin Boldog which is about an hour away from Ulaanbaatar. 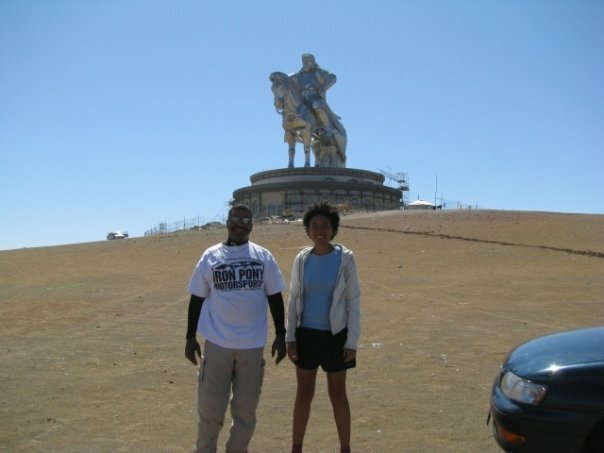 Supposedly you can go up into the head of Genghis Khan, but the day we went there, it was closed for reconstruction.